ANALYSIS: It is not the elections, but the facts on the ground that have Israel revealing its war on Iran. Pundits and politicians in Israel tried to explain why Israel now openly talks about its military activities against Iran in Syria after the Israeli air force (IAF) again carried out a large operation against Iran-related targets in Syria. Politicians on the left of the political spectrum in Israel think the announcements about Israeli strikes against the Quds Force of the Iranian Revolutionary Guards Corps were connected to domestic politics and the upcoming elections in Israel. “I am sorry to say it is all related to April 9 and political survival. Can someone explain to me what the benefits are of the announcements other than politics?” former IDF Chief of Staff and Israeli Defense Minister Moshe ‘Boogy’ Ya’alon told Army Radio (Galatz) in Israel. In reality, however, there are other factors which play an important role in the apparent decision to abandon the long-standing Israeli policy of remaining silent about the military campaign against the Quds Force and its predominantly Shiite allies in Syria. Let’s first take a look at what happened on Monday when the IAF again carried out a series of devastating airstrikes against Iran-related targets in Syria. 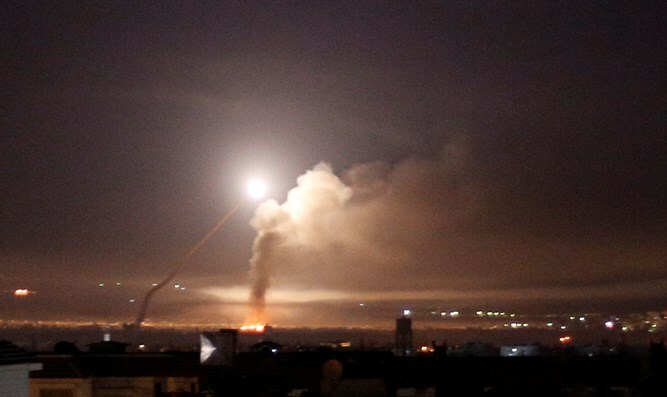 The assault, which was reportedly again carried out from the Mediterranean Sea and Lebanese airspace, destroyed Iranian military facilities and Syrian air defenses throughout the country. The so-called ‘Glass House,’ the headquarters of the Quds Force of the Iranian Revolutionary Guards Corps near el-Kisweh in the Damascus region, wasn’t targeted this time since it has been empty after earlier Israeli airstrikes. The ‘Glass House’ is where the covert war against Israel from Syrian soil had been overseen by Qassem Soleimani, the shrewd commander of the Quds Force, and his staff. The Israeli assault was in retaliation for an Iranian surface-to-surface missile attack on Mount Hermon in northeastern Israel on Sunday which followed a new IAF attack on Iranian weapon storehouses near Damascus the same day. The missile, which was launched from an area where the Quds Force wasn’t supposed to be under a Russian American de-escalation agreement, was intercepted by the Iron Dome anti-missile shield and caused no damages or casualties. In a highly unusual move, the Israel Defense Forces (IDF) released extensive information about the aerial attacks and said that the operation was aimed at the Quds Force of the IRGC and the regime of Syrian dictator Bashar al-Assad who is steadily turning Syria into an Iranian proxy. To understand the depth of Iran’s entrenchment in Syriam one should read a new analysis published by the Washington Institute for Near East Policy. As happened in Lebanon, Iran is entrenching itself “not only militarily, but also politically, religiously, and culturally,” according to the authors. This is done by “purchasing real estate, changing demographics, and by developing networks of support between Damascus and the Lebanese border” the report said. Iran is also “pushing social, religious, and economic programs designed to woo underserved and deprived communities which may not be ideologically aligned with Tehran but lack viable alternatives,“ the authors reported in a reference to the Sunni Arab population in Syria. The report also dealt with the situation in southern Syria, the area along the Israeli and Jordanian border, where Iran has established military bases and security networks over the past half year and is recruiting disgruntled Sunni Arabs who were part of the opposition front against Assad during the civil war. The authors urge the US Administration to take non-military steps to thwart the Iranian entrenchment in Syria, such as sanctions on persons who work with Iran to turn Syria into another proxy state. Israel, from its side, has apparently decided to prepare the ground for decisive action against Iran in Syria after the Trump Administration announced it would withdraw US Special Forces from Syria and would not interfere with Israel’s actions against Iran in Syria. Gady Eisenkot, the now retired IDF Chief of Staff, recently revealed that the Israeli military has carried out thousands of strikes against Iran-related targets in Syria and claimed this had stopped the Iranian military build-up in the country. Eisenkot also suggested that Iran’s activities in Gaza, Lebanon and Syria were responsible for the decision not to invade the coastal enclave again after its proxies Islamic Jihad and Hamas tried to drag Israel into an all-out war at the beginning of November 2018. Prime Minister Binyamin Netanyahu earlier indicated that Israel could soon see a major escalation in the war against what Iran and its allies call ‘the resistance front’. This happened after the Iranian-backed pro-Assad coalition announced it had changed the rules of engagement in Syria and would now respond to every Israeli strike against Iran-related targets in the war-torn country. Monday’s events were a new indication Israel has adjusted its strategy vis a vis Iran and it has little to do with the upcoming election in the country. The government in Jerusalem realizes that it will need the support of the international community to expand its campaign against Iran in Syria now that the Iranian axis has threatened to bomb Ben Gurion Airport near Tel Aviv and said it is ready to “eliminate” Israel via a multiple-front-war. In this respect, it’s important to understand that Iran is not only trying to heat up the northern front in Israel but is also trying to open-up fronts in Gaza and the 'West Bank' (Judea and Samaria).